This hidden spa in the city is a real gem! Who doesn’t love a budget-friendly facial in Singapore? It’s almost guilt-free, and it means you can easily justify getting a facial on a regular basis. A monthly facial is not only great for your skin – especially in Singapore’s city environment – but also very good for your mental health. That’s why when we were asked as a team to review Indulgence Beauty in Tanjong Pagar, there were a multiple of very willing participants in the office! So, what did we think of the treatments? We all have different skin types and skin problems, so it was great for us to try a range of services to see how Indulgence Beauty tackled our individual beauty challenges… read on for the full scoop! “I love a facial that uses high-tech products and equipment, because I believe you can really see a big difference in the quality of your skin post-treatment. This facial uses hyaluronic acid with molecules only five nanometres wide, which means it can reach deep into the skin. The machine feels like a mini pressure wash, and this gentle cleansing unclogs pores and removes dirt that builds up from makeup and city living. 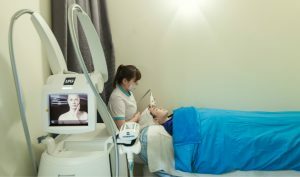 “One of the great things about my facial at Indulgence Beauty is that they didn’t recommend a treatment until after they had done a computerised skin analysis. Although the skin analysis was slightly alarming (hello, sun spots!) it allowed Anna, my aesthetician, to customise my facial based on the results of my digital scan. My treatment included an intense facial massage with the LPG machine, which is designed to stimulate circulation and reduce signs of aging. I also requested extractions which were thorough, but not painful. “I never leave the house without mascara, so I jumped at the chance to try out eyelash extensions. I must admit I was a little worried I’d walk out looking ridiculous with fake, too long-looking lashes, but Anna was an absolute pro and got it just right. I had a black tie event that night and felt very glam. Clear your diaries for this one, people. This facial is decadent, but it’s also looong (so don’t get caught on the hop when you lose all sense of time and miss the appointment you had scheduled for afterwards). What did I love about it? Everything! The facial used tonnes of science to really boost my tired and flagging skin (three kids: say no more). My clogged-up, exhausted face was blasted with a mini-jet wash to remove grime, before being treated to a heap of lotions, potions, masks and a massage that sounded technical but were oh-so-relaxing. This was definitely one of the best facials I have had in awhile. And because the costs are relatively low compared to some of the all-singing, all-dancing fancier spa options, it is absolutely one that my skin and my wallet would love to try again. Indulgence Beauty has very kindly offered a special for you readers to try it too! You can choose from the Hyaluronic Hyalogy Treatment at $88 for First Trial (u.p. $218), or another Beauty Treatment of your choice at 50% off for the first trial. Amazing deal huh? And as a bonus, they are offering 10% off all their MD Dermatics products! It’s located in the labyrinth that is Tanjong Pagar Plaza, which is close to the city and has cheap and easy parking – but it can be a bit of a maze of a shopping centre. To find the spa, you need to head to the second floor, and head towards the most Eastern side of the plaza – the spa is directly opposite Amara Hotel. If you are coming by MRT, take Exit A from Tanjong Pagar station. Indulgence Beauty offers some great packages – whether it’s IPL, customised facial treatments, Hyaluronic Hyalogy Facials, LHE Radiancy Facial, Radio Frequency Facials, RevitaPeels (using the USA MD Dermatics products) or Intensive Clarity Treatment programs. It’s hard to choose! But Anna and her team weren’t pushy at all, and very knowledgeable. Indulgence Beauty is definitely a great little hidden gem of a spa in Singapore! 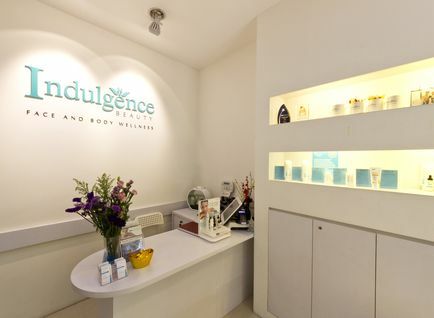 Indulgence Beauty, #02-34 Tanjong Pagar Plaza, 1 Tanjong Pagar Road, Singapore 082001, p. 6225 8980. Chris is a true-blue Aussie who has lived in Singapore for almost a decade. She loves discovering the un-discovered, locally and abroad. She’s the person everyone asks for recommendations on everything – and that’s why she started Honeycombers, a mere 8 years ago.